Do you have questions about AMC's loyalty program? 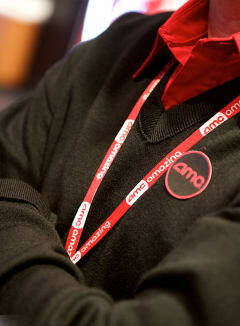 We've got answers to all of the most frequently asked questions about AMC Stubs™ and more! Make FREE online reservations to watch movies in any format, including IMAX®, Dolby Cinema and RealD® 3D. Get answers to your questions here. You’re a click away from MPAA ratings, Now Playing and what’s Coming Soon. Finding movie information fast is that easy. Want to request a donation or tickets? Want to advertise in theatre or to purchase group tickets? This section can tell you more about opportunities for businesses at AMC. Want information on how AMC got its start in the movie industry and facts about our company today? This section has all our corporate information, news releases and the history of AMC. Want to learn about our theatres? Here you'll find answers on our code of conduct, concessions at our theatres as well as how to rent a theatre for a professional meeting or private showing. Need information on tickets, passes, gift cards? Learn about what "No Passes" and "Special Engagement" actually mean and the restrictions on how passes can be used (with surcharges) to see just about anything. Chat with a support member.